After a hiatus from the U.S. recording scene as a solo recording artist, Carrington returned in 2008 with More To Say... (Real Life Story: NextGen). Joining her was an impressive all-star cast of jazz and contemporary jazz instrumentalists, including George Duke, Everette Harp, Kirk Whalum, Jimmy Haslip, Greg Phillinganes, Gregoire Maret, Christian McBride, Danilo Perez, Patrice Rushen, Robert Irving III (who also serves as co-producer), Chuck Loeb, Dwight Sills, and legendary vocalists Les McCann and Nancy Wilson. 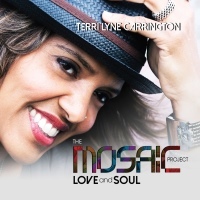 On August 7, 2015, Carrington releases The Mosaic Project: LOVE and SOUL. Like its predecessor, the album presents Carrington leading a rotating cast of superb female instrumentalists and vocalists that includes Oleta Adams, Natalie Cole, Paula Cole, Lalah Hathaway, Chaka Khan, Chanté Moore, Valerie Simpson, Nancy Wilson, Jaguar Wright and Lizz Wright, as well as saxophonist Tia Fuller, trumpeter Ingrid Jensen; bassists Meshell Ndegoecello and Linda Oh; and keyboardists Geri Allen, Patrice Rushen and Rachel Z. On The Mosaic Project: LOVE and SOUL, Carrington juxtaposes her salute to female artists by paying homage to various male artists who have either influenced her professionally and/or informed her musicality, such as Nick Ashford, George Duke, Duke Ellington, Frank Sinatra, Luther Vandross and Bill Withers. “Whenever I do something that celebrates women, I never want it to feel like it’s something that excludes men,” she explains. “On this record, I consciously wanted to celebrate the various relationships women have with men either through original songs of mine or cover songs by male composers and song writers.” The male presence and perspective on The Mosaic Project: LOVE and SOULis even more realized by Billy Dee Williams, who contributes insightful spoken-word interludes through the disc.